I'm so excited to share my next Barbie furniture tutorial with you today! We've already covered how to make a Barbie bed, and now the dolls have a place to relax in the living room. 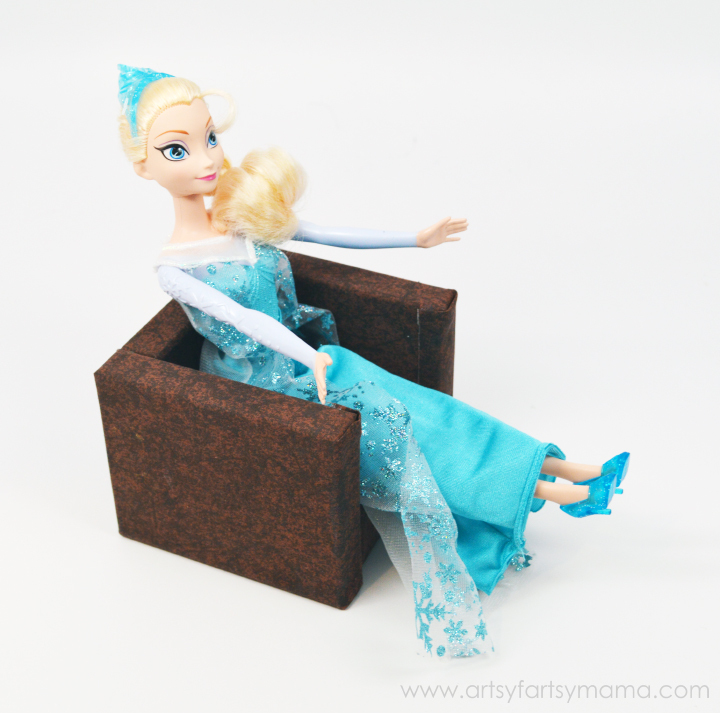 This Barbie couch and chair are incredibly simple to make, and it goes by really quick! It's also easy to personalize the furniture with a little paint, fabric, or vinyl! First, let me show you how to make the Barbie chair. The couch and chair basically have the same instructions, but the measurements are obviously a little different. The chair is also covered in fabric, where the couch has been painted instead. Once the blocks have been cut and sanded, it's time to add the fabric! No painting needed at all. Use your gift wrapping skills to wrap each side block with fabric to get a measurement for the amount of fabric you need for each block. The bottom and back pieces will just need a piece wrapped around the front & backs of the blocks - NOT the sides. 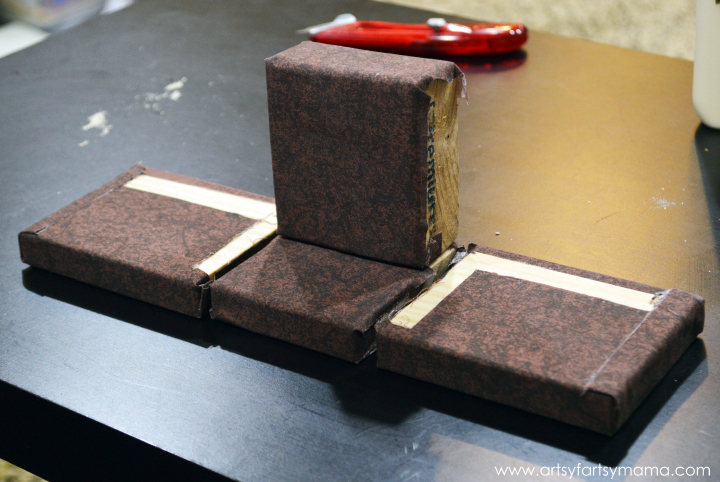 Once you have the fabric pieces cut to size, spray the front of the block with spray adhesive. Lay the block in the center of the wrong side of the fabric, and then spray the back of the block. Fold/wrap the fabric around the block as neatly as possible, and try to keep your corners looking as smooth as you can. When all the blocks have been wrapped, assemble them like in the image above. On the back side of the side blocks, cut an "L" shape on the side and bottom edges to show the wood. Wood glue does not hold the blocks together well when there is fabric in between, so you need to keep the wood bare where you piece them together (the main reason for keeping the sides bare for the bottom/back piece). Add a line of wood glue on the sides of the bottom piece, and along the sides of the back piece. Turn the side pieces up, and use clamps to keep the blocks all together. Let dry at least overnight in a place where the chair will not be disturbed. 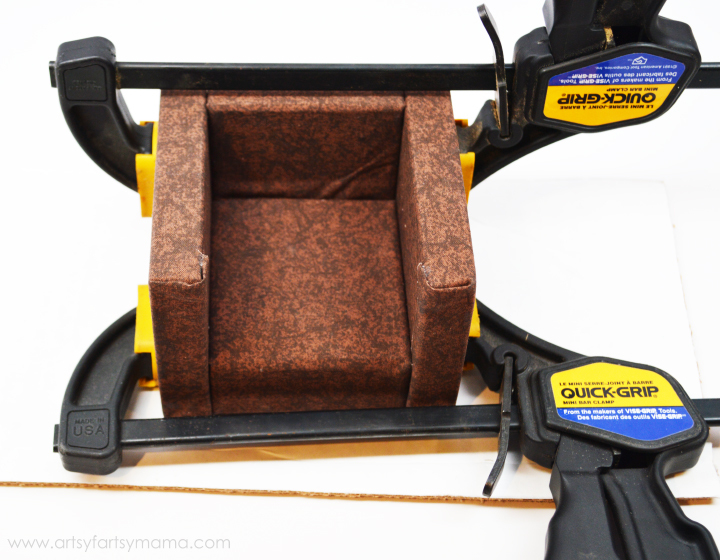 If your corners seem to peel up or anything, just add a drop or two of fabric or super glue to hold them back down. 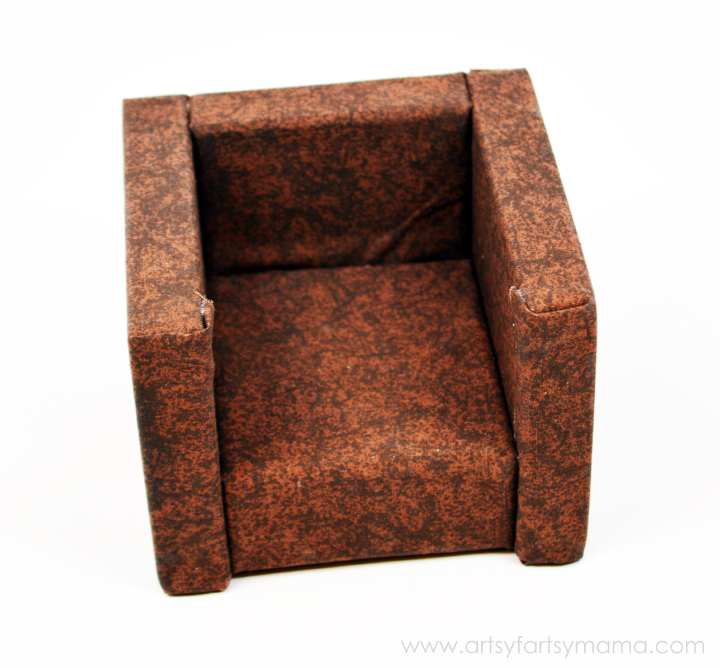 Your chair should now be ready for play! Even Queen Elsa approves! I think this technique for putting the couch together is 100 times simpler than putting fabric on like the chair. While it does give a completely different look, I think I prefer this method over the fabric. 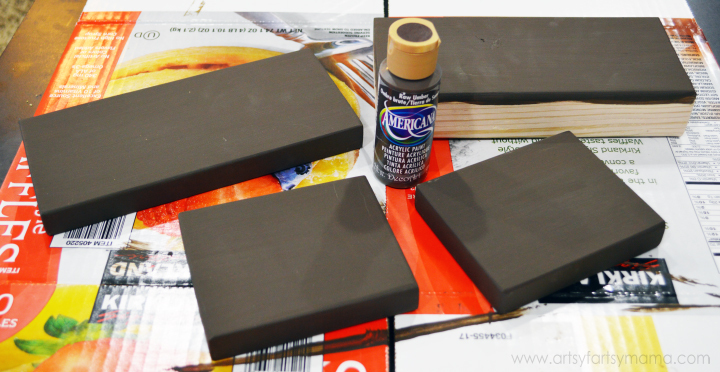 I painted each block with DecoArt Americana acrylic paint in Raw Umber. 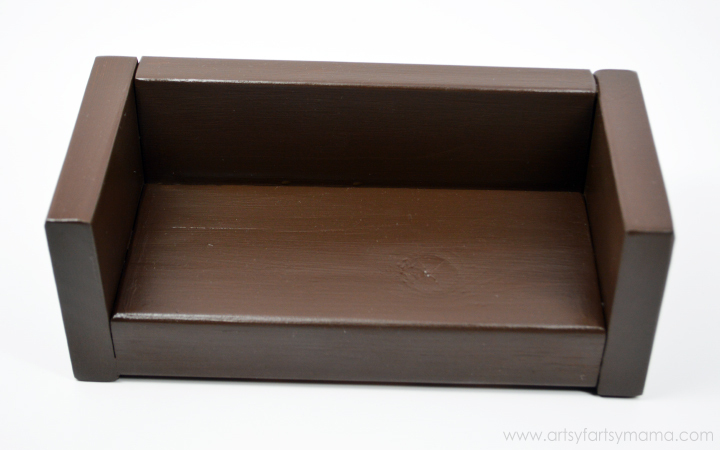 I painted about three coats on each side, letting it dry completely between coats. Next, add a line of wood glue on the sides of the bottom and back piece. Stand the side pieces up, and lightly press them into place. Use clamps to keep them in place at least overnight to dry. Once the couch is dry, give it a good coat or two of clear polyurethane spray sealant to keep the couch protected. 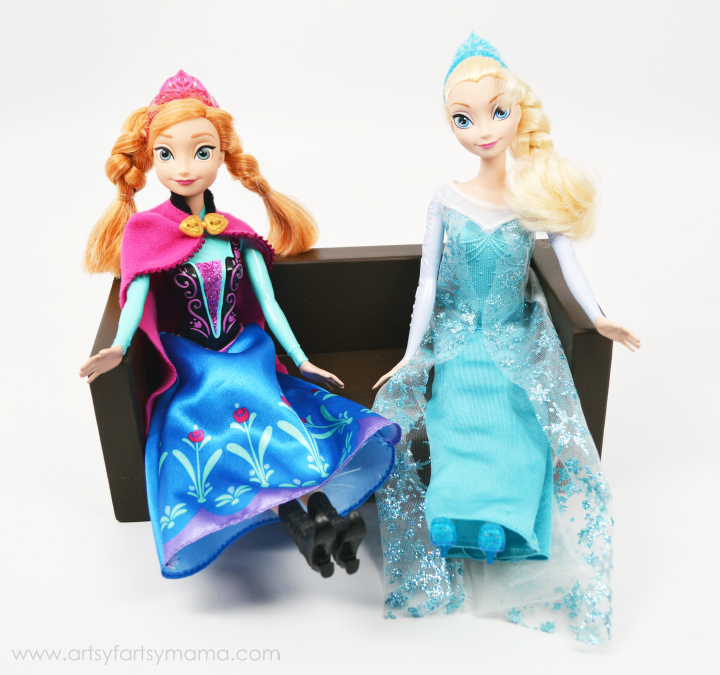 Your Barbies (or Frozen sisters) can now relax and visit on their new furniture!! In case you missed it, I've already shared how to make a Barbie bed and will be sharing more tutorials soon! These are so cute. I'm gonna have to make a few for my daughters dolls. Thanks for the tutorial. So cute! Can't wait until my daughter likes Barbies! How cute are these? I always wanted barbie furniture when I was little and never got any - so I'll need to remember this for when I have little girls! Those are adorable. I wish my daughter was still at the age for Barbies, I would be making this cute furniture for her. So cute! I had some just like these when I was little! When I see cute and fun tutorials like this for dolls, it really makes me wish I had a little girl. :) Very Cute! Ummm... you are pretty much the coolest mom ever! These are fantastic! Good idea! My nieces would love this! If you have other kid=friendly crafts, we'd love it if you would submit them. If you would like to display a featured button on your site, you can grab one from the right side bar of your post above. Thanks for a cool project idea!